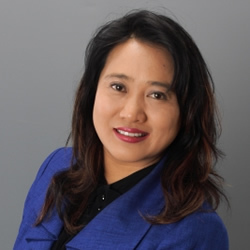 Dr. (May) Hongmei Gao is an Associate Professor of Business Communication and Coordinator of the Asian Studies Program at Kennesaw State University in Metro Atlanta. Her research interests include the globalization processes of Chinese and American corporations, intercultural learning and adaptation, race and diversity issues, and global occupational mobility. After earning her BA in English language and literature from Shanghai International Studies University in 1989, she worked as TV anchorwoman at China Anhui Television Station, as well as a PR specialist in the University of Science and Technology of China. She received her MA in Mass Communication from Brigham Young University in 2000 and her Ph.D. in Speech Communication from the University of South Florida in 2004. She has conducted business and cultural training workshops for over 15 companies, including Duracell, UPS, USPAACC, International Visitors Council, Nanfu Corp, Hua Tai Inc., Shanghai Municipal Government, and Skyrun Group. Dr. Gao currently conducts a research project on global business expansion strategies with 20 American and Chinese multinational corporations, including UPS, Home Depot, Duracell, the Sports Authority, Inductotherm, Lenovo, and Haier. She has published in journals of communication, management, and Asian studies. She also has publication in the form of book chapters and has presented at many academic conferences in the area of business, management, communication, and business languages.